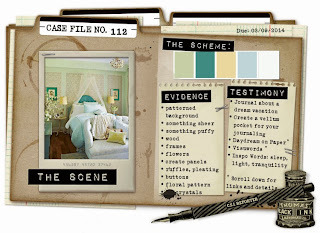 ... the window frames on the bottom RH corner are actually CSI Coordinates from a previous Case File - these are printables designed by Michele Singh for CSI members to download free (FABulous!). Some of the frames are made of wood, so that's two pieces of Evidence in one! ... some sheer silver-grey fabric, some muslin I coloured with mist and two pieces of satin which were machine-embroidered by my Mum. So, how am I doing with Case File 112 so far? Evidence: patterned background, something sheer, wood, frames, buttons, floral pattern, flowers, crystals, ruffles. Testimony: I've taken the word "daydream" from the testimony and called my kit "Daydream Believer" and I am planning to make some vellum pockets for my journaling. I enjoyed trying a different slant on the challenge this month - now I'm looking forward to catching up with the blog hop to see what all the Master Forgers have come up with - and there's a fun contest to have a go at! Oh that is a gorgeous kit, I definitely didn't gather enough embellishments! Beautiful kit Annie - I wondered if the CKCB would appeal to you this month! This is an amazing kit! You will surely get an abundance of use out of this. I can't wait to see what wonderful layouts come out of this kit! Yummy yummy kit.Love that vellum. absolutely love this kit-want those doilies, frames and that woodgrain bag! Can't wait to see what you do with that lovely satin! Cor, what a fabulous kit! I'm especially envious of all the luscious looking embellishments!